Backdropped by a colorful part of Earth, space shuttle Atlantis is photographed by an Expedition 21 crew member on the International Space Station soon after the shuttle and station began their post-undocking relative separation on Nov. 25, 2009 during the STS-129 mission. 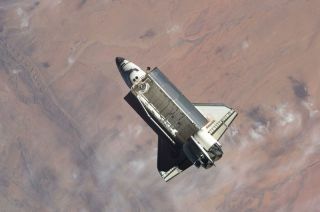 The sevenastronauts aboard space shuttle Atlantis are hoping for clear skies aboveFlorida so they can return home today. Atlantis isdue to land at 9:44 a.m. EST (1444 GMT) to cap an 11-day delivery mission to theInternational Space Station. The weather is expected to cooperate, missionmanagers said. ?I can tellyou already, it?s looking pretty good,? said entry flight director BryanLunney. Atlantis ispoised to land at NASA?s Kennedy Space Center, where the shuttle launchedon Nov. 16, after a week-long stay at the space station. Astronautsperformed three spacewalks to deliver nearly 15 tons of huge pumps, tanks,gyroscopes and other large spare parts that will keep the space station goinglong after NASA retires its three remaining space shuttles next year. Atlantis isalso ferrying astronaut Nicole Stott back to Earth after her three-month stayon the station. Stott launched to the station in August and is the last stationcrewmember to be switched out using a NASA shuttle. MissionControl roused the shuttle crew early Friday with the song ?Home Sweet Home? byMotley Crue, a tune selected for the entire crew. ?The wholecrew says, ?Thank you very much!?? Stott said. ?Especially this one!? Stott islooking forward to seeing her husband and young son for the first time inmonths. Returningto Earth aboard Atlantis with Stott are shuttle commander Charlie Hobaugh,pilot Barry Wilmore and mission specialists Leland Melvin, Randy Bresnik, MikeForeman and Robert Satcher, Jr. The astronauts spent the Thanksgivingholiday in space, and even managed to have the space version of a turkeydinner. ? Bresnik isespecially hopeful for an on-time landing today and is looking forward toholding his new baby daughter Abigail for the first time. She wasborn last week just after his first spacewalk. SPACE.comis providing complete coverage of Atlantis' STS-129 mission to theInternational Space Station with Staff Writer Clara Moskowitz and ManagingEditor Tariq Malik. Click herefor shuttle mission updates and a link to NASA TV.